4-Day Cruise To Bahamas - Which Cruise Line To Choose? 4-Day Cruise To Bahamas – Which Cruise Line To Choose? A 4 day cruise to the Bahamas is a popular choice with travellers and cruise lines alike, as just about any line you can name offers it on multiple sailings each year. From Florida’s ports, where the Bahamas is basically a hop, skip and a jump away, a 4-day cruise allows you a short time on board and a few days at your destination for a great vacation get away. Which cruise line to choose will depend on which part of the Bahamas you would like to visit and which departure port is the most convenient. Carnival offers popular Port Canaveral cruises departures, as do Disney and Royal Caribbean. Carnival docks at Freeport or Nassau and Half Moon Cay, depending on which ship you choose, while on Disney you visit Nassau and their exclusive island of Castaway Cay. If you prefer Ft. Lauderdale as your departure port, Princess Cruises offers a sailing to Princess Cays before returning to the U.S. Like West Palm Beach? Then Celebration is the cruise line for you, taking you on a 4-day cruise to the Bahamas with the stop at Grand Bahama Island. This cruise offers 2 nights on board and 2 at their land hotel, the Our Lucaya. If Miami is a better fit for a departure port for Florida cruises to the Bahamas, then Norwegian’s sailing to Grand Bahama Island and Stirrup Cay may be something to look into, as is the Royal Caribbean offering that stops in Nassau, Cococay and Key West before heading back to Miami. A 4-day cruise to the Bahamas offers that perfect getaway to the warm waters and endless beaches of the region, allowing you to relax, play water sports, swim with the dolphins, fish, snorkel and scuba dive. 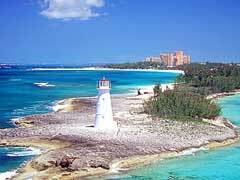 With so many lines offering the service, cheap cruises to the Bahamas can be had at virtually all times of the year. Bahamas cruise deals range from half price from the lines that want to fill up their sailings– usually found in last minute bookings– to discounts for the military, families or singles. Most lines also use onboard credits as incentive to cruise with them over the competition. Whether it’s Princess, Carnival, Celebration, Royal Caribbean, Norwegian or Disney, you can rest assured your 4-day cruise to the Bahamas will be a memorable vacation destination for all in your party. Grab the swim fins, and let’s go!